Understanding Humor in Japan is a thought-provoking collection by an impressive group of specialists. Japanese conventions about comedy and laughter are largely unanalyzed. For many students of Japanese culture and visitors to Japan, Japanese humor seems obscure, incomprehensible, paradoxical, and even nonexistent. 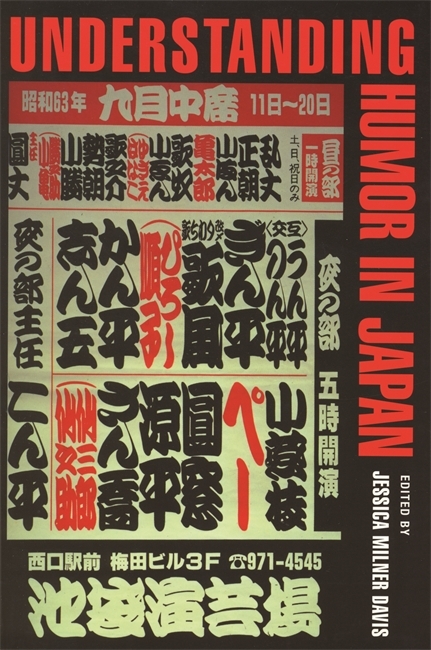 By bringing together scholarly insights and original research by both Japanese and non-Japanese experts, Jessica Milner Davis bridges the differences between humor in Japan and the West and examines the entire spectrum of Japanese humor, from ancient traditions and surviving rituals of laughter to norms of joke-telling in ordinary conversation in Japan and America. For anyone interested in Japan, Japanese culture, and humor studies, Understanding Humor in Japan is an important teaching tool. It provides accessible, illustrative examples of humor in both Japanese and English with explanations of their meaning and cultural significance. Scholarly yet readable, these essays offer intelligent discussion on such topics as the Japanese delight in wordplay, the comic content of Japanese newspapers, the role of film and television in developing Japanese stand-up comedy, and formal censorship and its impact on humorous writing and self-expression in Japan. Understanding Humor in Japan breaks new ground in the study of humor and sheds light on much that is taken for granted about the role of laughter in civilized societies. Jessica Milner Davis is an honorary visiting fellow in the Department of Arts and Social Sciences at the University of New South Wales in Sydney, Australia. Understanding Humor in Japan is a thought-provoking collection by an impressive group of specialists. Every chapter is both approachable and interesting. This is a rare book that can be enjoyed by persons at every level of knowledge." The purpose is stated in the well balanced title; it is to invite the reader both to understand Japanese humor and to have an insight into the ways in which the Japanese seek to understand and explain humor. The introduction makes it clear that it is a carefully selected set of essays by Japanese, American, and Australian experts on Japanese humor intended to render key facets of Japanese humor comprehensible to readers with an interest in but no prior knowledge of the subject. The essays that comprise the book present the latest findings in Japanese humor research. It is new, it is significant, and it is comprehensive." This book is practically the first in the field and therefore it is a contribution in its entirety. . . . [Understanding Humor in Japan] will be a very useful reference work for many years to come and will enable anyone whose research brings them into contact with humor in Japanese society to see the whole spectrum of ways in which the Japanese use and consume humor in their lives and culture." Understanding Humor in Japan is a fine example of a work that goes beneath the surface and explores many aspects of the supporting cultural structures and historical circumstances that have shaped and influenced Japanese humor…Humor scholars of all sorts will discover that Understanding Humor in Japan encourages broad consideration of the many complex connections between language, culture, history, and their roles in shaping the humor in any given society." Many of the essays gathered together here point out paths for investigation that others might follow and offer much of interest and weight. The volume is also a model of how scholars, nonscholars, Japanese, and non-Japanese might come together and have a fruitful, edifying, and entertaining conversation. What more could be asked for?"